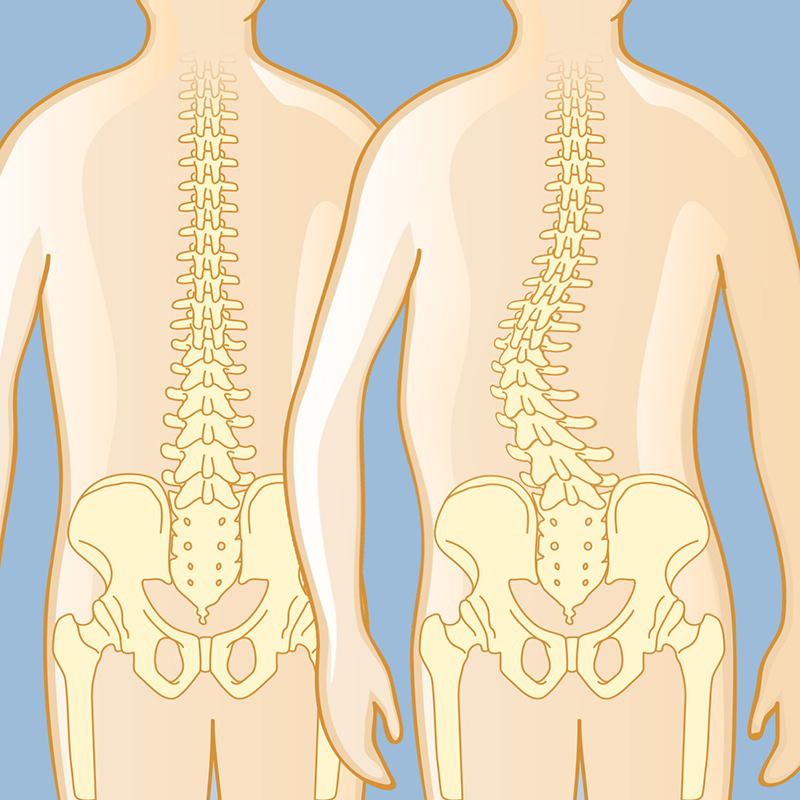 When viewed from front or back, a healthy spine is completely straight (left); in a patient with scoliosis (right), the spine can be seen to curve laterally. The sideways spinal curve of adult scoliosis can lead to an uneven distribution of weight that can cause pain and neurological problems including weakness. Adult scoliosis is not just disfiguring but can be disabling as well, as any spinal deformity that causes an individual’s body to compensate in unnatural ways can lead to pain and discomfort. Some cases of scoliosis are idiopathic, meaning it’s not known what causes them, but sometimes the causes can be congenital, neuromuscular, or associated with known syndromes (such as neurofibromatosis). Adult idiopathic scoliosis (idiopathic means the cause is unknown) is the condition in which an individual has had scoliosis since childhood. A person may have scoliosis in adolescence but never had it treated, or had a mild condition that was treated but got worse with aging. Congenital scoliosis is a birth defect in which the ribs or spine bones don’t develop properly. Neuromuscular scoliosis is scoliosis caused by disorders that affect the muscles, such as cerebral palsy, muscular dystrophy, spinal muscular atrophy, and spina bifida. These cases are often severe and require surgery. De novo scoliosis describes adult scoliosis in people (usually older than 40) who have no history of scoliosis as adolescents but then develop a curve from changes in the spinal column linked to osteoporosis, degenerative disc disease, compression fractures, and spinal stenosis. As a disc degenerates, it loses height. Pressure on the spine and gravity cause it to curve, and the deformity increases as more discs become affected. Compressed nerves can lead to numbness, sciatica, low-back pain, stiffness, fatigue, and other symptoms. 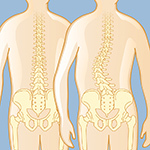 Scoliosis may develop as a complication following other surgeries. Post-surgical complications/iatrogenic scoliosis (iatrogenic means as a result of medical intervention) — such as when spinal fusion or a laminectomy does not heal properly — often requires a second, revision surgery. Traumatic accidents and certain infections and cancers can lead to damage to the nerves, muscles, and spine, which can develop into adult scoliosis.